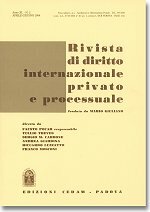 The second issue of 2014 of the Rivista di diritto internazionale privato e processuale (RDIPP, published by CEDAM) was just released. It features one article and three comments. The Enrica Lexie incident has given rise to two disputes between Italy and India, one concerning the violation of the United Nations Convention on the Law of the Sea (“UNCLOS”) rules on piracy and criminal jurisdiction in the case of an incident of navigation on the high seas, and the other concerning the violation of the international rules on the sovereign functional immunity of military personnel abroad. Regarding the first dispute, there is a difference of opinion between Italy and India as to the interpretation of the UNCLOS provisions that govern the jurisdiction of domestic courts to adjudicate on the merits of the case. This has led to a conflict of jurisdiction between the two States that, as examined in this article, could be resolved by recourse to the compulsory arbitration provided for in Annex VII to UNCLOS. Such arbitration may be commenced even by just one of the parties. By contrast, as concerns the second dispute recourse to compulsory dispute resolution mechanisms would appear quite problematic as a result of the gradual erosion of the principle of sovereign functional immunity of State organs. The establishment, under international law, of the proper interpretive approach to broadly phrased waivers of sovereign immunity from execution is an unsettled issue, which was not addressed in legal theory or practice until recently. However, this issue became practically relevant in the wake of certain hedge funds’ strategy to seek the collection of defaulted sovereign debt in any available jurisdiction. Most important in this respect are the recent judgments of the French Court of Cassation in NML v. Argentine Republic, where the Court held, in fact, that, under customary international law, waivers of execution immunity may not extend to a particular category of state assets, unless expressly referred to. The present article examines the accuracy of the Court’s proposition in light of the major parameters for the determination of the relevant standards of interpretation: the 2004 UN Convention on Jurisdictional Immunities of States and Their Property as well as the pre-existing state practice, i.e. the settled case law regarding the interpretation of general immunity waivers in light of the diplomatic and consular law principle ne impediatur legatio, and the submission of execution immunity waivers to certain restrictions under domestic statutes. The Authors take the view that the interpretive criteria of the Vienna Convention on the Law of Treaties are applicable by analogy to immunity waivers inserted in government bonds, leading to the adoption of a rather narrow approach. It is further suggested that, under the well-established principle that the plaintiff bears the burden of proof with respect to any exception to execution immunity, the “asset specificity” requirement may reasonably be seen as the allocation of the risk of ambiguity of immunity waivers to the judgment creditor. Finally, the Authors argue that the restrictive interpretation of general immunity waivers may serve as a functional substitute for lacking clear-cut international law rules on state insolvency, insofar as no international law rule protecting good faith restructuring procedures from the speculative tactics of vulture funds is yet in force. EC Regulation No 1346/2000 on insolvency proceedings allows for the coexistence of different proceedings with respect to the same debtor. This engenders certain problems in terms of efficiency of the insolvency administration within the European Judicial Space, thus menacing the “effet utile” of the Regulation. This article focuses on such problems, explaining the shortcomings which affect the Regulation and wondering whether ECJ managed a solution for them. As a matter of principle, preventing the opening of secondary proceedings seems in several cases to be a suitable means for protecting the main proceedings’ purposes. However, at the same time, not opening secondary proceedings could hamper the interests of local creditors, which rely on them to safeguard rights and priorities on the grounds of the local lex concursus. The Author addresses the main aspects of this tension. The Regulation is under revision as result of the 2012 Proposal of the European Commission, which, inter alia, aims to strike a balance between the aforesaid interests at odds. In this paper, the Author carries out a critical appraisal of the envisaged amendments, taking also into account the recent reactions of the other European Institutions, so as to ascertain whether they could really achieve such a balance. This paper focuses on the novelties introduced by the European Court of Human Rights’ judgment in Henry Kismoun v. France, which concerns the issue of transnational continuity of names: in Henry Kismoun v. France the Court recognized the need of protecting the unity of a personal name on the basis of Article 8 ECHR, also with regard to the secondary name conferred on a person, in the State of the person’s second citizenship. The novelties introduced by this judgment could influence the future jurisprudence of the European Court of Justice which has granted protection to the unity of the name firstly attributed on the basis of the EC Treaty (now TFEU) without referring to fundamental human rights. At the domestic level, fundamental human rights have been used to grant protection to transnational continuity of names of non EU citizens by the Italian courts, first, and by the Minister for Internal Affairs, then. Moreover, Article 8 ECHR constituted the legal basis to grant new Italian citizens the right to maintain the name they were assigned abroad. In addition to introducing new interpretational perspectives about the issue of continuity of name across borders, the above mentioned judgment and the new Italian practice seem to constitute an additional step in the direction of the establishment of the “method of recognition” based on the vested rights theory, and bear a great impact on the issue of continuity of personal status across borders.